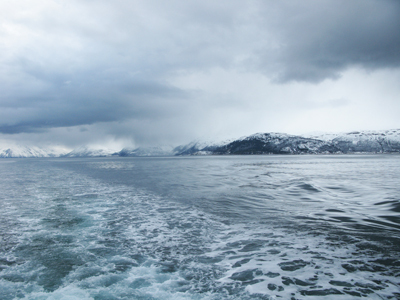 Skidaway Institute scientists Marc Frischer and Jens Nejstgaard are participating in a research cruise in the Barents Sea, north of Norway. This is an account of the experience from Marc. First day of the cruise. Everyone is excited and anxious. We were all on board the ship by 9:00am and busy scurrying around making final preparations, securing instruments & lab gear and setting up the various work stations. The crew was exceedingly helpful and efficient. The Marine Tech was delayed in Oslo (coming by plane) so we couldn’t leave until he arrived. He made it around noon and we were underway at about 12:45pm. We headed north through the fjords. The scenery was fantastic. Calm water, snow and fog covered mountains, sun and clouds. Not too much wildlife present, some seabirds. The captain (Tom Ole) predicted that we’d see a lot of life near the ice edge, perhaps even whales. Next week they have a whale observing cruise scheduled in the same area that we are heading to now. After discussions with Aud Larsen and Jens Nejstgaaard we decided that due to our late departure we would head to immediately to the polar front and ice edge to take full advantage of the night to steam. Of course night doesn’t really feel like night since it only gets dim for a few hours this far north this time of year, but for some reason we still get tired. We also decided to stop a various points along our course to characterize the water and plankton communities. We are occupying a standard transect used by IMR (Norwegian Institute of Marine Research) called Fugløya – Bjørnøya and are lucky that the previous week (25 – 29 April 2013) this line had been run giving us a pretty good idea of what we’ll find this week. The data from the previous week indicated that water conditions are not unusual and that we could expect to reach the polar front approximately 225 NM north of our first sea station after leaving the fjords. Our goal is to locate water masses containing the algae Phaeocystis pouchetti in various stages of its bloom cycle so that we can study how it is eaten (or not) by other organisms and thereby contributes to the food web. It’s a very interesting and mysterious algae because of its importance as a major blooming algae in high latitude waters and because whether it is eaten seems to be highly variable. We suspect that at times it is readily eaten and at others it is not and that this is mainly due to its ability to dramatically alter its size, chemically defend itself from predation and its resistance to ubiquitous viruses. Despite the fact that this algae is slimy and smelly, all of us who study it love it because it’s so interesting. We call the project “Phaeo Enigma” because there is so much we don’t understand about this organism. We stopped around 3:30 pm (13:30 GMT) in the fjord to take a quick sample. The water column profile was classic textbook fjord with a chla maximum at about 23 meters. The water contained big colonies of the algae we are studying (Phaeocystis pouchetti), but we are sticking with our plan to head north. Continuing north we finally made it to our first sea station at 70 30 N 20 00 E. Again, it was a quick stop to look at the water. As we expected we found classic Norwegian Coastal Current water. Phaeocystis was present here too, though at lower concentrations that we found in the fjords. After a quick 30 min stop we were back on our way. Since there wasn’t much to do most for the remainder of the evening, most of us thought it was prudent to turn in early for the evening. Soon enough we will all be very busy!